The Smart City is and will definitely be one of the most important challenges over the next few decades. From now until 2050, it is estimated that more than six billion people will be living in urban environments, i.e., nearly 75% of the Earth’s population. The mass concentration of individuals in cities creates many opportunities, but also carries with it its share of urban management problems: pollution, poverty, security, cost of living, mobility, etc. 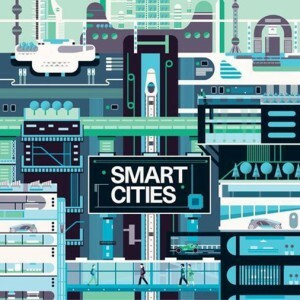 Although the smart city is a trend for some and a necessity for others, it is obvious that, with the demographic explosion of our cities, we have to rethink our way of life and how we use our resources, consume and move about. For example, did you ever want to automatically and precisely know the closest street parking place to save time, gas, CO2 emissions in the city and to foster traffic flow? The transition to the smart city involves optimizing information technology to better understand our infrastructures and the behaviours of people and to be able to make informed decisions that meet the needs of citizens, institutions and companies with a view to community and sustainable development. Cities especially need information and the means to use it efficiently. In fact, just like roads represented the basis of past traditional urbanism, since the 19th century, electricity, information technology and communications now represent the nervous system of the modern city. Information systems determine urban and urbanism development policies, while helping citizens and companies make decisions to improve their quality of life in the urban space. However, it is imperative to understand that most “urban events” that require decision-making are characterized by a geographical place. The city indeed is above all a place, a geographic environment in all its complexity. The urban issues are local and there are just as many solutions. Therefore, there is always a “location” aspect behind all “urban events”. WHERE the traffic jams are and when they take place; WHERE road work is; WHERE parking is available; WHERE the needs for collecting and managing urban waste are and how much; WHERE the heat islands are; WHERE sunny areas are that are good for urban agriculture or for solar energy; WHERE and at what distance citizen services are; WHERE aqueduct network leaks are; WHERE public WI-FI is available; WHERE and when the bus comes; WHERE electric car chargers are located, just to name a few examples. Geospatial technologies, such as modern geographic information systems (GIS) and data capturing technologies, are at the heart of the smart city, because understanding the “WHERE” component is critical for making an informed decision. Geospatial technologies largely meet these communication needs, while emphasizing the geographical aspect, which plays a fundamental role in optimizing the understanding and management of the urban space. Moreover, the possibility of viewing information related to a geographical point, often in real time, from Web platforms and interactive mobile applications, allows citizens and stakeholders in the different urban services to interact and contribute to information exchanges at all times and to monitor changes in the city. GIS are normally designed to provide a wide range of options to foster decision-making with their immense capacity to store information and descriptions, to handle and analyze information, and to simulate and forecast events. Since GIS are made up of local information, such as the assets of a city, and used to represent it, they are increasingly becoming the tool for determining the level of intelligence of the city. Certain cities will set up GIS integrating assets that are useful to several departments and agencies, whereas others will reserve GIS to certain areas (infrastructures, transportation, security, public services). GIS can therefore be adapted to the different informational needs. GIS are proving to be powerful management tools and are at the heart of the smart city, since they guide decisions based on events taking place at specific urban sites in order to optimize the efficacy of the city while minimizing the negative effects related to overpopulation. I believe that the smart city requires, first and foremost, the mastering of the concept of “WHERE”, e.g., the geolocation of urban elements, their movements and interactions with citizens. However, given that the information management needs of the smart city vary depending on their specific context, solutions must be highly personalized, adapted and certified by geospatial professionals. Contact us for information about our Geospatial Data Collection and Management solutions or to take advantage of our expertise!